I love a good prime rib roast. You know – deeply brown and crispy on the outside. Perfectly cooked the whole way through. No sign of grey meat. That’s the dream. Reverse sear prime rib makes that dream a reality. It’s the exact same as reverse sear steaks but on a bigger scale. A grander scale. And this is how you do it. 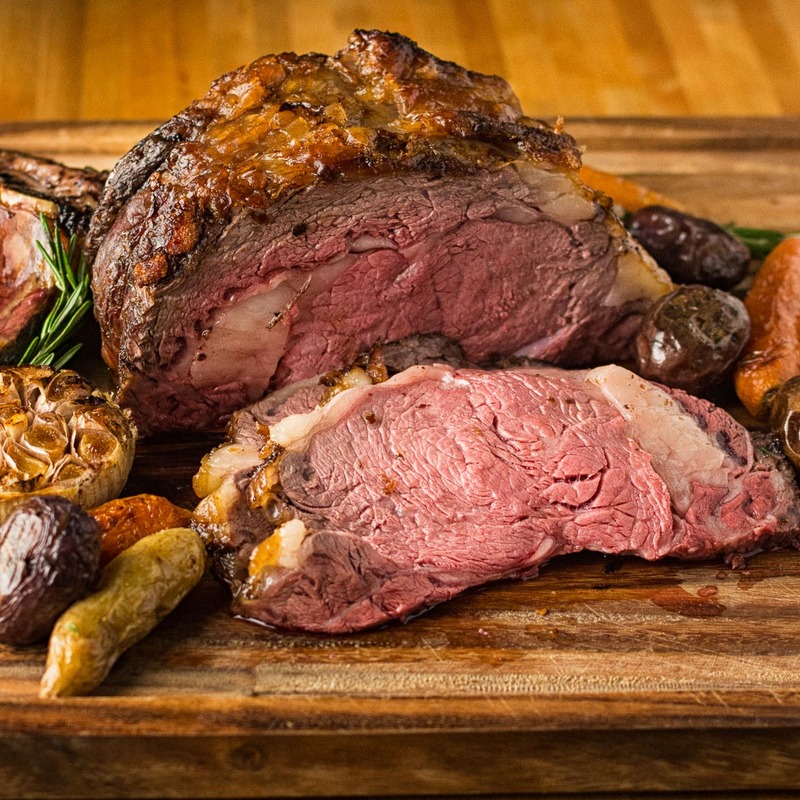 This is the Serious Eats prime rib recipe. If you want more details that’s where you’ll find them. There’s a few steps involved to reverse sear prime rib. First, unwrap your prime rib and let it air dry for a day or two in the fridge. Just make sure you don’t bump other things into it and you’ll be fine. Then cook it low and slow in a 225F oven. This takes time but it is time well spent. It took almost 3 hours for a 2 rib roast. For a big one plan on 4 or more hours. Pull it from the oven when the internal temperature hits 125F. Let it rest for 30 to 60 minutes. Crank your oven to as high as it will go – like 500F – and let it pre-heat. Return the rested prime rib to the oven and blast it for 10-12 minutes to crisp up and really brown. Done. Perfectly done. There’s one problem with reverse sear prime rib. And it’s a big one. Everything comes at a price. In this case the price is no fond in the bottom of the pan. No beautiful little flavour bombs to make your gravy. Luckily there’s a way to fix that. Sort of. It won’t be as good but it will work. If you can get some demi-glace, that fixes the problem nicely. Just add it into your gravy. Problem solved. If you can’t you have a bit more work to do. Demi-glace isn’t that hard to make but it takes time. Make a roux with some of the fat in the pan and about equal volume of flour. Add the best beef or veal stock you can find or make. Concentrated veal stock works really well here. Season it with salt and pepper. Or you can just serve the prime rib sprinkled with a bit of fleur de sel. That works too. At the end of the day you have a choice to make. Roast your prime rib at 325F and live with the grey meat on the outside. You’ll get a great gravy. 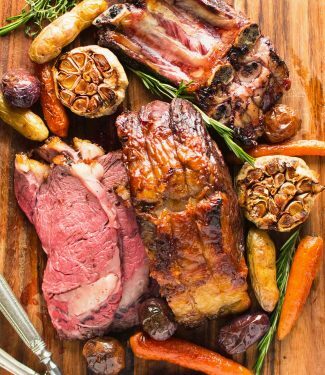 Unwrap your prime rib. Place it on a cookie sheet, ribs down and let air dry for 1-2 days. Pre-heat your oven to 225F. Place the roast in an oven proof dish (it will need to withstand 500F at one point) and place it in the 225F oven. If you have a thermometer with a remote probe place it in the centre of the roast. If you don't then start checking internal temp after 2 hours. You are shooting for 125F internal temperature. When you get to 125F remove the roast from the oven. Let your roast rest for 30-60 minutes while your oven heats to 500F. While your oven is heating start preparing your gravy. Add the red wine to a saucepan and simmer briskly until reduced by half. Add your stock and reduce slightly. After the roast has rested for 30-60 minutes return it to the oven and blast it for 10 minutes to brown and crisp up. Remove from oven and remove roast from the pan. Spoon off all but 2-4 Tbsp of beef fat. Place pan on medium low heat. Add half as much flour as you left fat in the pan. If you have 2 Tbsp of fat, add one Tbsp of flour. Make a roux by stirring the flour and fat together. Cook, stirring constantly for about 1 minute. Add the warm stock/red wine mixture slowly, stirring constantly. Bring to a simmer. Adjust seasoning. 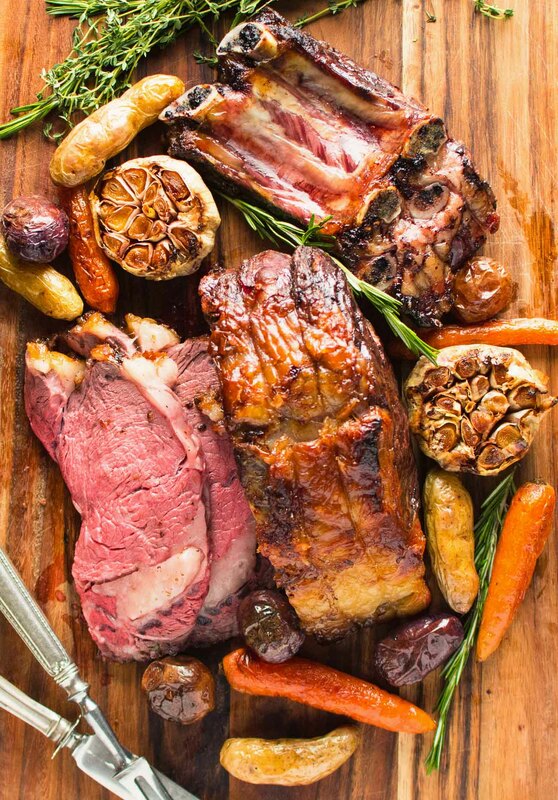 Carve the bones out of the prime rib and cut into slices across the grain. Serve with gravy. The recommended range of stock and red wine scales with the size of your roast. Bigger roast. More liquid. Thank you! You don’t need a big freezer to make the concentrated veal stock. That’s the beauty of it. You reduce it right down to almost nothing. A full batch is about 2 ice cube trays worth. Takes almost no room at all. Thanks Joyce. Anyone can do it – stick it the oven and wait, and wait, and wait. It is pretty fool proof if you have an instant read thermometer. Preparing prime rib at home has always scared me, I’m terrified that I’ll mess up this beautiful cut of meat! Thanks to you, I’m not afraid anymore! 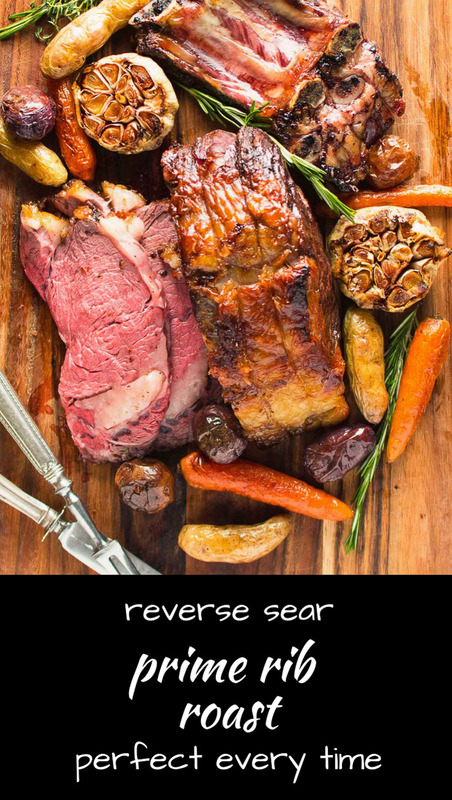 Your technique to reverse sear the prime rib looks and sounds amazing! Thank you so much for such a detailed recipe, I can’t wait to make this on Valentine’s Day! I’m so glad you are trying it. Happy Valentine’s Day! I am planning a dinner where I will prepare a 15 lb prime rib. Would you possibly have an idea of how long that will take if cooking to medium rare? I have never tried such a big roast. I would guess somewhere between 4-5 hours. There is 30 minutes of wiggle room in the resting period that you could probably stretch a bit so I would budget 4 and 1/2 hours of low roasting time with 30-75 minutes of resting time before the final sear. Remember that whatever happens, you need to pull it at the desired internal temperature. Time is a guideline. Internal temperature is the real metric and 125-127 should give you a pretty even medium rare (like the pictures). Good luck. I’m sure it will be a fantastic dinner party. I was thinking about putting the roast in the Sous Vide at 50C for about 3 hours then putting it on the rotisserie in a very hot BBQ full of wood smoke for 15 minutes to add a bit of smokiness and crisp the skin up. Unfortunately like your plan, there will be no fond at the bottom of the pan. I’m going to try putting a pan under the roast in the BBQ as it turns and see what I get. If we want it med should we take it out of the oven @ 130 internal? Once out of the oven will it continue to cook? We are using a 2-1/2 lb roast in a convection oven set at 200 degrees. It may continue to cook out of the oven although at 200 degrees oven temp it won’t come up much, if at all. I’ve never tried this with such a small roast and I never take beef past medium rare. 130F is probably a good bet but keep a close eye on the internal temp as you sear it. Sounds like it will be a wonderful night. I’ve tried this method – works great. 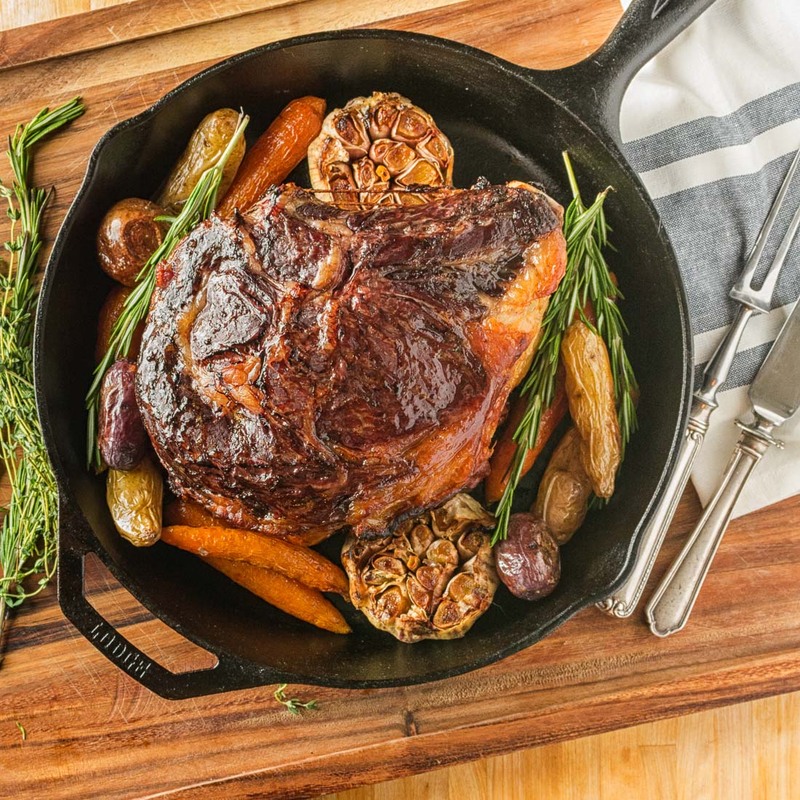 Have you ever slow roasted it and then seared it the next day? I’m in a situation where I don’t have time to roast it but could do it a day ahead, put it in the fridge, set it out to room temp and then sear. Would it still be cold in the middle? I’ve never tried that. Pretty sure it would still be cold in the middle. Especially if it’s a big roast. That’s a tough one. I’m sorry I don’t have an answer for you.